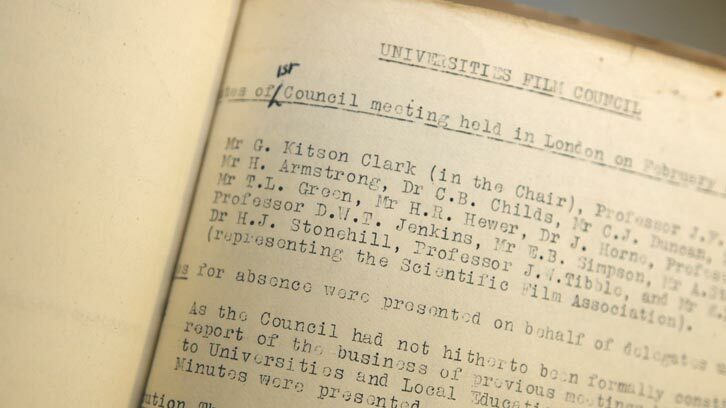 Learning on Screen began life in 1948 when a group of pioneering university teachers were driven to promote the use of film in higher education and research. They founded the Universities Film Council, which soon became the British Universities Film Council (BUFC), before the word ‘video’ was added in 1983. During these early years the organisation was sustained by a handful of volunteers who identified and addressed the audiovisual needs of higher education and built up a collection of educationally relevant films for the membership to access. The advancement of education in the universities and institutions of university standard in the United Kingdom by the coordination and development of the use and study of film and related media, materials and techniques for the purpose of university teaching and research. The advancement of education by promoting the production, study and use of moving image, sound and related media within education and research, for the public benefit. To make moving image and sound as important in education and research as the written word. Our longevity and continuing relevance is rooted in the strength of our commitment to this vision. We have always been clear about who we are and why we do what we do. We have come along way since we were first established in 1948. The audiovisual landscape has changed beyond recognition in 70 years and the scarcity of resources is no longer the issue it once was. The issue now is providing members with discoverable high-quality, reliable material with known provenance and supported by enriched metadata. As students and teaching staff increasingly conduct learning online, this material needs to be available remotely and instantly, at the click of a button. Over the years, we have changed as an organisation, developing our membership services as times and needs change but we remain committed to our original and unwavering vision – to make moving image and sound as important in education and research as the written word.